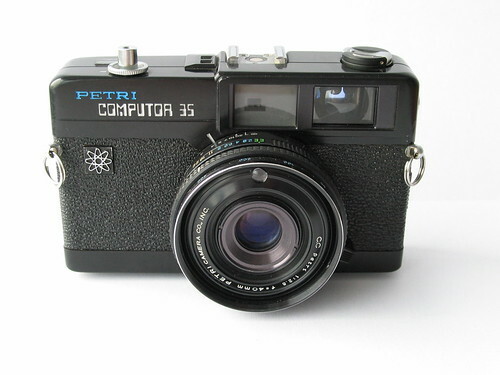 The Computor 35 is the first in a series of 35mm rangefinder cameras made in Japan by Petri from about 1970. 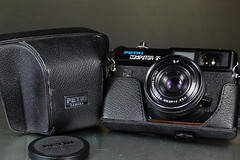 The Computor 35, produced from 1970 until 1974, despite the introduction of the later models has automatic exposure via a CdS cell mounted on the front of the lens (inside the filter thread so that the meter takes account of any filters used) and electronically-controlled shutter. 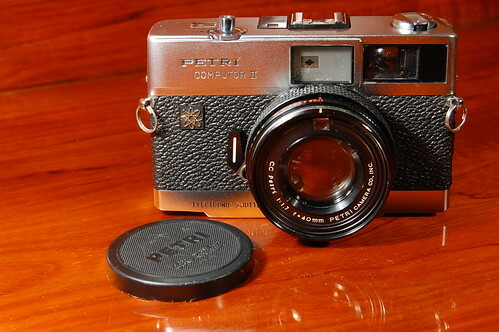 There is a coupled rangefinder operated by the focussing ring with a lever attached for one-finger focussing (shown in the picture, to the right of the lens). The film speed is set by a ring at the front of the lens between 25 - 800 ASA. The lens is labelled C.C. Petri 1:2.8 f=40mm, stopping down to f22, and there is an aperture ring. However, in normal use, the aperture ring is set to E.E. (presumably for electronic exposure), and both aperture and shutter speed are selected automatically according to the meter reading. The manual aperture settings are intended for use with flash; when any manual aperture is selected, the shutter speed is set to 1/30 second. The shutter gave speeds from 4 to 1/250 second: with green and red LEDs on the top of the camera and also in the viewfinder, indicating whether the selected speed is above or below 1/30 second (i.e. warning of camera shake in hand-held use). The camera has a hot shoe and also a PC socket. It was available in black or silver-topped finish. It must have a battery to function. A very similar camera was sold as the Honeywell Visimatic 615.
a faster f/1.7 40mm lens. a new Seiko ESF shutter, giving speeds steplessly variable between 2 and 1/1000 second. As the first model, the camera calculates shutter and aperture values automatically, and manual aperture settings are available for use with flash.. The bright finder is not so very bright on the example seen, although it may have yellowed with age. 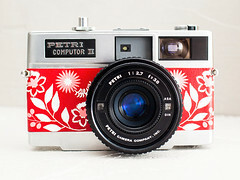 A hard to find camera, the Computor III has only a 38mm f/2.7 lens. The film-speed setting was moved inside the filter thread, and the light meter sensor was also moved slightly. ↑ 1.0 1.1 1.2 According to McKeown, James M. and Joan C. McKeown's Price Guide to Antique and Classic Cameras, 12th Edition, 2005-2006. USA, Centennial Photo Service, 2004. ISBN 0-931838-40-1 (hardcover). ISBN 0-931838-41-X (softcover). p580. ↑ Grenier-Natkin catalogue page from 1972, reproduced in the Computor 35 listing at Sylvain Halgand's site (see links below). 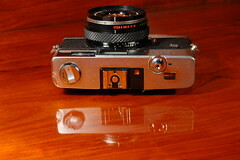 ↑ This discussion on Rangefinder Forum suggests that the camera functions with any of several batteries. Given its age, a substitute for (two) 1.3V mercury cells may be correct, but one of the contributors to the RFF discussion found that more modern 1.55V silver oxide batteries worked well. ↑ However, a comment on this photo of the Honeywell camera mentions some minor differences. The lens on the Honeywell camera is of the same specification as the Computor 35 though, and it is certainly not the same as the Computor II, as suggested in the comment. ↑ The Computor II on 35mm-compact.com site shows a switch on the rear selecting F or A (assumed to be Flash/Automatic) - which perhaps disables the auto-exposure and enables the aperture control on the lens for flash. There is also a table to calculate flash aperture from subject distance and flash Guide Number. This page was last edited on 15 November 2017, at 11:36.